“It took a community of Mercy to pull off a grace-filled Kasalang Bayan,” Mr. Rick Flores, the Kasalang Bayan organizer and Assistant Campus Minister for Student Formation posted on his Facebook wall after the successful Kasalang Bayan or mass wedding initiated by the Campus Ministry Office (CMO) last March 25, 2017, Saturday at Sacred Heart Parish, Cebu City. There were eleven couples who were officially wedded on that memorable day. The Kasalang Bayan (KB) was organized and celebrated to culminate the Year of Mercy. On January 23 to February 8, 2017, the soon-to-be brides and grooms who were non-Catholics received Catechism session. On February 11, the non-Catholic participants received Baptism and Confirmation in preparation for their wedding. The Sacrament of Confirmation was also given to the other KB participants on February 18, 2017. On March 6-10, Fr. Joel Liwanag, SJ, facilitated the Canonical Interview to the participants. The Pre-nuptial Pictorial (c/o Mr. Anthony Hejie Suralta) was done from March 11 to March 18. The couples then had a confession from March 13 to 17. On March 19, all KB participants listened to the Pre-Cana Seminar at Sacred Heart Parish. To prepare for their wedding day, the couples had a Wedding Practice from March 20 to 24. Finally, on the sun – kissed morning of March 25, 2017, eleven brides walked down the aisle to be with their respective grooms for their Wedding Day. Fr. Joel Liwanag, SJ, who officiated the wedding ceremony, reminded the KB participants that just like Mary, they were also invited by God to say their special “yes” to their partners in life. “Ang inyong ‘Oo’ karon, special,” Fr. Joel said. He said that it was a special “yes” not just to their partners but also to God. It was a special “yes” because they were making their promise in the presence of God and in front of the whole assembly of the Church. Second, Fr. Joel said that it was a special “yes” for it is an eternal “yes” to their partners through the good times and the bad. Thirdly, it was a “yes” that is tied with the lifetime commitment and responsibility of being a partner and a parent. And although the responsibility may become too heavy for them, the couples need not worry because God and their families are always there; ready to extend a helping hand. At the end of the homily, Fr. Joel prayed and blessed the couples that they will be able to imitate Mary’s “yes” to God as they remember their promise to each other for them to live a happy and peaceful married life. The eleven newlywed couples then proceeded to Sacred Heart Activity Center for the Reception. The Faculty and Staff Club officers, together with some volunteer teachers, welcomed and served the newlyweds as they enjoyed the rest of the day with their respective families and children. From the Campus Ministry Office to the Faculty and Staff club, the administrators and benefactors of the school… it certainly took the whole SHS-ADC community to make the Kasalang Bayan a reality. 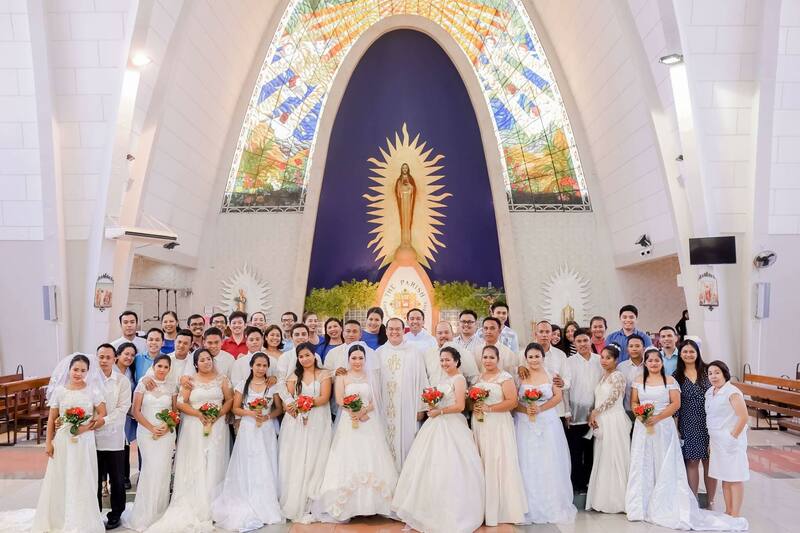 More than the exchange of “I do’s”, the eleven lovely couples in the Kasalang Bayan tied the knot to mirror God’s unconditional love for each other and their respective families as they move through their lifetime challenges together. Indeed, God was a God of Mercy for He allowed such a beautiful event to happen in the lives of these eleven couples, for He used many instruments make this event a success and for His fountain of Mercy flowed unto people’s hearts to help in making this event an unforgettable one! Ad Majorem Dei Gloriam!